We are releasing a video for All-American Violation today. We wanted to put it out a bit sooner, but we delayed it a few times because we did not want it to be associated with any one particular political controversy. I decided that America in 2017 is probably not going to have a week go by without a major political controversy and that today was going to be the day regardless of what was in the news. Yes, this song is political, but it shouldn't be attached to any one administration in particular. It refers to a general dissatisfaction for the political, financial, religious, and social systems in my country. This is a point in the album where anger and desperation are at their highest. You're trying to get out, but you are boxed in. I wrote this song with my brother, Jonathan, and he is playing on the recording of this song along with Ryan. Despite the anger of the song, we had a great time tracking guitars in the studio for this. Here's the video. I'm proud of it. Dig it! We had a great album release thanks to many of you. For those that did not know, we tried to do something a bit different and live stream the album with a companion video while chatting on Facebook. It went well, and we had very few connection issues for those watching. We plan on doing something similar to that type of thing again in the future. It is nice to experiment. It is quite nice hearing so much positive feedback from people about the new album. We really do like to talk, even if it isn't about ourselves (hah! ), so feel free to keep reaching out via whatever channels you like. With that in mind, we want to do a bit more with our mailing list. You're thinking, "Wait, you have a mailing list?". Yes, we do. We've never sent anything out to anyone that's provided an email through Bandcamp or wherever, but we are going to change that soon. You can sign up here. Please know that while lots of people SAY that they won't be spamming you with a ton of stuff, we really mean it. We plan to use the mailing list for certain updates and sharing things that we don't post right away to other channels. We will also be recruiting some of you for a crowdsourcing kind of project in the future. Lots of fun stuff and we definitely won't sell your address or any of that king of garbage. Also, we put together a little lyrics video for Trapped in the Center of an Unstable Loop (hey, there's another one of those "say that three times fast" titles that Mark seems to be fond of. There are a ton of lyrics and a lot going on during that song, so we thought this one would be a good candidate to try that kind of thing with. You can watch a YouTube embed below, or you can watch it via our Facebook page. Lots of folks say this, but if you can do the whole "like, comment, share" thing, it actually does help us out. Stay groovy and we've got more to come! This time next week, our new album will be out. We decided it would be cool to go ahead and release another video for The Great Repression before the album comes out. I (Mark) had an idea for a video companion to The Utterly Dismal Theorem and the Formation of a New Universe that I sent to my director friend, Sheridan Cleland. I had this idea for a Noah's Ark vibe with some old Mel-O-Toons animation that I had been kind of obsessed with recently. Sheridan took that and really ran with it in such a cool way. Also, if you pre-ordered the album on Bandcamp, we are making that song available to you now too. Bonus points if you can say "The Utterly Dismal Theorem and the Formation of a New Universe" three times fast. Talk soon and here's the video! We have a release date and are ready to go! 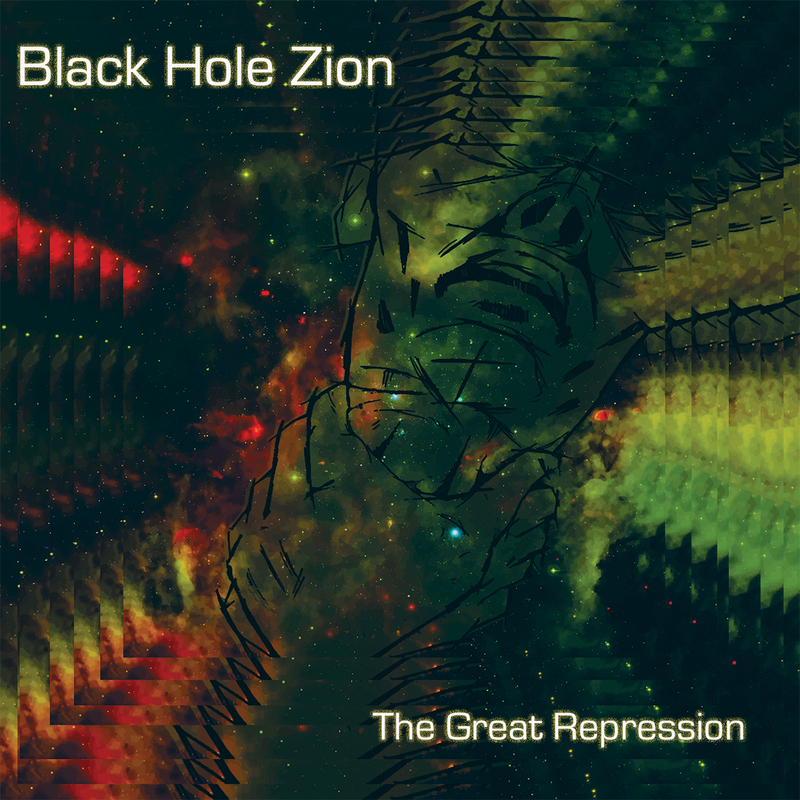 The Great Repression will be released on August 4th, 2017. As we've said before, we are doing a physical release and a digital download for this album. The physical CD will have a full color booklet and lyrics. In the music community, some folks complain that physical albums don't sell. That is partially true. However, there's also the fact that lots of musicians don't put a lot of effort into album art anymore. The Great Repression is not like that. A lot of effort was spent working on our own and with other visual artists to create a physical release with some depth that is interesting to look at and read while you listen. You can pre-order the album via our Bandcamp page. In addition to the physical album, you get a digital download of the whole thing in a variety of formats. If you pre-order, you'll also get an advanced download of our first single, 8-Bit Rage. 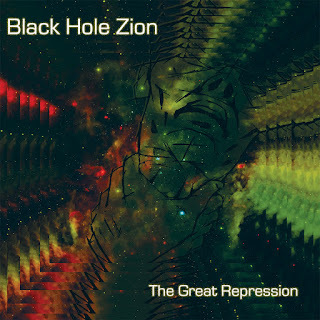 The Great Repression will also be available on Spotify, iTunes, Amazon, and several other outlets on the August 4th release date. Since we're talking album art and release date stuff, how about a picture of the album cover by the super talented J. Hicks! We will also have videos for a few of the songs to release soon. As I've written before, we are proud of this album and the effort we have put into it. Now that things are wrapping up, we are ready to start playing live again. We can now announce that we will be playing Shocka-Con 6 on Friday, September 8th, 2017 in Charleston, WV. 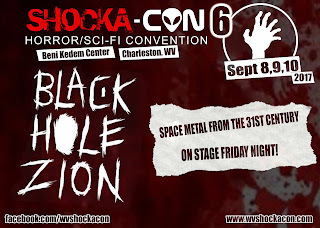 Shocka-Con is West Virginia's premiere horror and sci-fi convention, so Black Hole Zion is obviously a great fit. You can learn more at http://wvshockacon.com/ . OK, that's it for now. Next update is coming soon though. We are almost ready to put out a new album, and I’m really excited about it for a lot of reasons. One of those is that it will be the first album that every member of the live band has recorded something for. That means Ryan playing guitar, George playing drums, me on vocals and a few other instruments, and Corey on some of the bass tracks. That includes a really beautiful bass line that Corey added to the end of one track (that already had amazing guitar work from Ryan). It was really important to me that every person in the live band play on this, and I am so glad that I stuck to that. As you can probably guess from the title of this post, the album is called, The Great Repression. I think I would rather let the lyrics speak for themselves at this point, but it definitely tells a story that is rooted in far-fetched science fiction and reality simultaneously. Speaking of that, our plan right now is to do a physical release that includes a full booklet with lyrics and lots of art. I know a lot of people don’t buy physical music right now, but I think it is important sometimes to have something to listen to and also look at that reinforce each other. If you aren’t a physical release kind of person, it will be available on a lot of digital download and streaming services too. We are working with a few artists and also doing some things ourselves to that end for album art. All of the music is finished, so once the artwork is complete, we are ready to put this thing out. I am looking forward to sharing some of that artwork from these folks soon too. I’d also like to take a moment to thank Terry from I Am the Liquor for finishing up all the mixing on this. I had gotten to a point where everything was recorded, but I couldn’t quite let go for a variety of reasons. Thankfully Terry is someone with lots of talent that I also trust. We anticipate a summer release for this, so check back as we share more stuff to see and hear.